Though both have their roots in the mists of antiquity the Gaelic and Brythonic mythologies are of two different characters. They can be likened to two seperate rivers fed from one source. The Mabinogion is drawn from a number of sources, the Red Book of Hergest dates from the fourteenth century, though it is believed that the older tales were first transcribed in the tenth or eleventh centuries. The Gaelic material was transcribed in some cases at an earlier date, some in the seventh and eighth centuries. Because of this the Welsh tales are often 'harder' to decipher than the Gaelic. Over time mythology has given way to literary needs. The sacred tales of the Gods, became tales of heroes to entertain a feasting Prince. The Children of Don, despite maintaining links to their divine origins, appear as magicians, semi-divine heroes and supernatural beings. The Gaelic material is consideribly greater in number, and also the literary work from which we work is from older sources. The myths surrounding the Tuatha de Danann are epics in themselves, their divine status is unquestionable, their tales are writ large across the landscape of Ireland. Nudd would appear to be a complex figure, as is the case with many Celtic Deities. In the interpretatio Romana he is sometimes equated with Mars, Silvanus, or even Neptune. The story in which he loses a hand and has it replaced by a silver one is an ancient one, however it is hard to tell exactly how widespread it was during the Iron Age, so there is a possibility that it spread through later 'borrowings'. His name is thought to mean 'Cloud-maker', so perhaps he has his origins as a Indo-European Sky God. He is clearly the same as the God Nodens, who had a temple dedicated to him at Lydney, by the River Severn. A bronze icon found nearby shows a representation of the God, his head encircled by a halo. The site has also provided us with a link to dogs, as many representations have been found there. Although seen as a warrior, his main shrines are dedicated to healing. Under the name of Lludd, a temple dedicated to him used to lie under what is now St.Pauls Cathedral, London. According to Geoffrey of Monmouth it was called Parth Lludd, which the Anglo-Saxons translated as Ludes Gaet, present day Ludsgate. This same name is found in Arthurian legend as Lot. In the Gaelic tradition he appears as Nuada Argetlamh 'Nuada of the Silver Hand', who was the leader of the Tuatha de Danann at the time of the first Battle of Magh Tuireadh. During the battle against the Firbolgs, he lost a hand. In Ireland a man could not be King if he were 'flawed' in any way, so Nuada was forced to give up his position. Dian Cecht made him a silver hand (hence the byname), and later Dian Cecht's son Miach made him a new hand of flesh and blood, allowing him to regain the Kingship. He was killed in the second Battle of Magh Tuireadh whilst fighting the Fomorii leader Balor. Llyr and his son Manawyddan are cognate with the Gaelic Lir and Mananan. Llyr is the God of the Sea. In Welsh mythology he is the father of Manawyddan, Bran the Blessed and Branwen. Lir, like his Welsh counterpart, is a God of the Sea, though in the case of the Gaelic myths his son Mananan mac Ler seems to take over his position and so features more prominently. It is probable that more myths refering to Llyr/Ler are now lost to us and that his popularity was greater, especially considering the number of figures called 'son of Llyr/Ler'. Manawyddan is one of the seven men who return to 'the Isle of the Blessed' with Bran's head after the battle in Ireland. 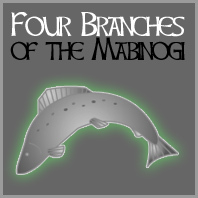 Manawyddan features in the Third Branch of the Mabinogion, where he becomes Lord of Dyfed and the husband of Rhiannon. The tale is one of enchantment, where Manawyddan and his small group are forced to assume the roles of different merchants before returning to Dyfed. Here, after the disappearance of his wife and friend he finds the source of the enchantment, Llwyd, son of Cilcoed. He was seeking to avenge Gwawl, whom Pryderi's father Pwyll have play 'badger in the bag' with. Through catching Llwyd's wife, in the shape of a mouse, he forces Llwyd to return his friends and wife and to realise Dyfed from the enchantment. Long after his contempories have been consigned to dusty tomes of mythology, Mananan mac Ler remains in Gaelic hearts, indeed in recent times it was said that he still walked the Highlands and the Islands of western Scotland. In the story of Cuchulainn Mananan shakes his magic cloak between Fand and her mortal lover Cuchulain so that they should forget one another. He is also associated with a magical mist which forms the veil between the worlds. He was foster-father to Lugh, whom he wrapped within the fold of his cloak and took to his Otherworld home beyond the sea. He pocessed magic pigs, which constantly renewed themselves, and were the chief food of the Tuatha de Danann, which like Aduina's apples in Norse mythology, kept the Gods from aging. He had many famous weapons, two spears called Yellow Shaft and Red Javelin, two swords Great Fury and Little Fury. His boat was called Wave Sweeper, and his horse Splendid Mane. He also pocessed a magic crane-bag, that was able to contain a great number of treasures. At various times this crane-bag came into the pocession of a number of heroes including Cumhal Mac Tredhorn and Finn mac Cumhaill. Llew would seem to be the Brythonic interpretation of a deity prominent among the continental Celts, giving his name to the towns of Laon, Leyden, and Lyons (Lugdunum). In Britain he gave his name to Carlisle (Luguvalium). His festival, Lugnasad, was held on August 1st. In the Mabinogion he is portrayed as a youth who, assisted by father/uncle Gwydion, struggles to overcome a series of geases cast by his mother, Arianrhod. He is to have no name, no arms and no human wife, unless she herself grants them. Through the trickery of Gwydion he gets all three, the last been a woman created from flowers and called Blodeuwydd. He is later severely injured out of circumstances arising from his wife's infidelity with Gronw. He could only be killed if a series of impossible circumstances were met. He would have to be neither riding nor on foot, beneath a roof of without, one foot in water the other out. Blodeuwedd, persuaded him to show her how this would be done, were upon Gronw, rising from the shadows casts his spear at Llew. The injured Llew lept into the air, and assuming the form of an eagle flys off to a certain tree on a great plain. Gwydion hears of this and sets out to find him. The image of Llew, injured in the branches of this magical tree has clear links with the tale of Odin and that other Axis Mundi, Yggdrasil. In its high branches, Lleu Llaw Gyffes. Lleu will fall into my lap. Llew is returned to his own shape from that of the eagle and is brought back to health. And he sought recompence from Gronw, who agreed to stand in the same spot as Llew had done whilst Llew cast at him. Gronw asked if he may place a stone slab before him, and Llew agreed. Llew cast his spear, which bored through the rock and killed Gronw. In the Gaelic myths Lugh beginnings are equally as difficult as his Brythonic counterpart. Balor, King of the Fomor is told that he will meet his end by the hand of his own grandson, so to remove this threat he imprisons his daughter Eithne upon Tor Mor. Now Balor covetted the magical cow of Cian, who lived on the mainland with his two brothers Sawan and Gobain the smith. One day, whilst Sawan was guarding the cow Balor tricked him and stole it away to his island. Cian got a druidess called Biroch to get him into Eithne's tower where triplets were conceived. On learning of the birth of the children Balor ordered them to be drowned, but as the servant walked down to the shore one of the children fell into the sea where Biroch transported the child to Cian. He was named Lugh, and at the second Battle of Moirtura succeeded in killing his Grandfather. Lugh has many bynames. `Lamhfhada` Long-arm, `Samildanach` Much-skilled, `Ildanach` seer and `Maicnia` Boy-warrior. He is a warrior, but also a master of all the crafts necessary for society. The House of Don has more than obvious links to the Gaelic Tuatha de Danann. Don is the wife of Beli, cognate with the Gaelic Bile. That both Don and Danu were seen as 'Mother' Goddesses is clear, though we should not fall into the trap of thinking that the principle was universal amongst the Celts, or that Don/Danu fulfilled the role for all. That doesn't mean that the Celts wouldn't have been aware of such a concept though. rounded hills in Kerry known as the Paps of Anu. Peter Beresford Ellis states that Beli is also cognate with the Continental 'Belenus' although the root of the names differ. Belenus means 'the Shining One' and he was seen as a Solar Deitiy, while Bile is believed to have a meaning along the lines of 'sacred tree'. He is a progenator of the tribe, a god of the ancestors, and as such a god of the dead and the underworld. The gaining of Wisdom is a central motif of many cultures. In both Gaelic and Brythonic tales a number of similarities crop up, particularly that wisdom is linked to water. In Gaelic myth the gaining of wisdom is linked to the Salmon of Wisdom. These fish are said to eat the cast of nine magic hazel trees that surround a pool. Finn Mac Cumhaill is said to have gained his prophetic abilities from the Salmon of Knowledge, when cooking the salmon for his master Finneces (Finn the Poet), three drops burned his thumb which he thrust into his mouth. From that day forth all he had to do was place his thumb to his lips and he would 'know' all that he needed. Another tale involving Finn has him gaining his wisdom when he traps his fingers in the door of a Sidhe. Ceridwen and the Cauldron of Wisdom feature in the gaining of wisdom in Brythonic mythology. Ceridwen, wife of the giant Tegid and mother of the beautiful girl Creirwy and an ugly boy Avagdu. It was for this boy that Ceridwen set out to brew a magical drink to make him the greatest bard in the world. Just as in the tale of Finn it is when three drops of the liquid burns the finger of Gwion Bach and the boy thrusts his finger into his mouth that he gains knowledge of all things. Thus, Taliesin was born of Ceridwen after tasting the magical brew from her magic cauldron of inspiration.. It is of interest to note the simularities between the names. Finn, in Old Irish 'Find', is derived from the Celtic 'Vindos' which seems to mean wisdom or to shine. 'Bright' may mean either knowledgable or shining. The Welsh 'gwn' also stems from this same word and means 'to know'. And Taliesin is said to mean 'Radiant Brow'. Fintan, who according to tradition had lived through all the invasions of Ireland, was reknowned for his wisdom. His name seems to have come from 'Vindo-senos' - Finn the Old One. This may perhaps tie in with the Welsh 'Henwen' and 'Gwyn hen'. Modern translations would be Old White or Old Blessed.